Columbia University professor David Swift is called to the hospital to comfort his mentor, a physicist who’s been brutally attacked. With his last words, the dying man gives his former pupil a seemingly random string of numbers that could hold the key to Einstein’s last and greatest secret. Einheitliche Feldtheorie. Einstein’s proposed Unified Theory – a set of equations that could explain all the forces of nature – would have revolutionized our understanding of the universe. But Einstein never discovered it. Or did he? Within hours, David is arrested and interrogated by the FBI. But they’re not the only faction pursuing the long-hidden theory. A Russian mercenary also wants David to talk – and he will do whatever it takes. On the run for his life, David teams up with an old girlfriend, a brilliant Princeton scientist, and frantically tries to piece together Einstein’s final theory to reveal its staggering consequences. What a fun, terrifying and thrilling book this was! Mark Alpert’s debut novel, Final Theory, helped to bring me out of my reader’s block and into a world that, if Albert Einstein had succeeded in discovering the Theory of Everything, would be a far more dangerous and scarier place than the real world already is. Having a world renowned physicist (in the world of physics and mathematics) for a father may have helped me pick up this book based on the premise but it was the thrill of the chase and the characters that kept me reading. David Swift is leading a life as a divorced father, allowed to spend only a few precious hours a day with his beloved son Jonah, when his life is changed suddenly and drastically. A friend of his has been tortured for information and is dying at a New York City hospital and David has been summoned to see him in his last moments. It’s in this meeting that David finds himself on a quest to keep Einstein’s Einheitliche Feldtheorie safe from the monsters who are on the hunt for it, which led to David’s friend’s imminent death. And so David goes on a dangerous, quick paced adventure that will reunite him with a woman from his past as well as a scientist at Carnegie Mellon University’s Robotic Institute, whom David had interviewed for a book he published about Einstein and his assistants. 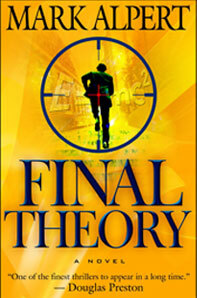 The characters in Final Theory are rich, special, well written and helped to draw me in to this great story. I was continuously surprised with the plot twists and found myself exclaiming out loud, “Oh my God!” over and over at certain parts of the book. That’s a good book if you ask me! It had been a while since I read a real thriller and I enjoyed the quick pace and excitement that Mark Alpert gets across through the written word. The last real thriller I read was Dan Brown’s Angels and Demons. Last September, the Large Hadron Accelerator at CERN under the France/Switzerland border (part of the focus of Brown’s bestseller), suffered a malfunction shortly after being turned on for an experiment that would possibly recreate the Big Bang within the particle accelerator. (You can learn more about that experiment HERE.) Well, this April, to help promote the May release of the film adaptation of Angels and Demons, Tom Hanks will flip the switch after repairs to the damaged magnets are completed. This Hadron Accelerator is like the Tevatron at Fermilab, outside of Chicago, which plays a roll in Alpert’s Final Theory. To learn more about the CERN event click HERE. I could picture the film adaptation of Final Theory very easily as I was reading it and wouldn’t be surprised if we are lining up at the theatre in coming years to watch that very thing. Mark Alpert is an editor at Scientific American. His job is to simplify “complex scientific ideas for the magazine’s readers.” Alpert has made a little video introducing his book, Final Theory, which you can view below.